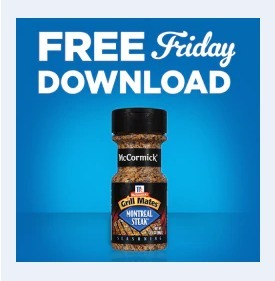 1 Free McCormick Grill Mates Bottled Seasoning (2.5-3.5 oz.) in Kroger stores, with coupon. This Kroger Free Friday Coupon is available for download on Friday, November 16, 2018 but you have until December 2, 2018 to redeem it. What is McCormick Grill Mates Bottled Seasoning? McCormick Grill Mates Bottled Seasoning is a mix of ingredients that brings spices and extra taste to your food. Ingredients: coarse calt, cpices (including black pepper and red pepper), garlic, sunflower oil, natural flavor, and extractives of paprika. Redeem your coupon in-store within 2 weeks for 1 free McCormick Grill Mates Bottled Seasoning (2.5-3.5 oz.). Your coupon will automatically be applied at checkout when you use your Shopper’s Card. Available in most stores.